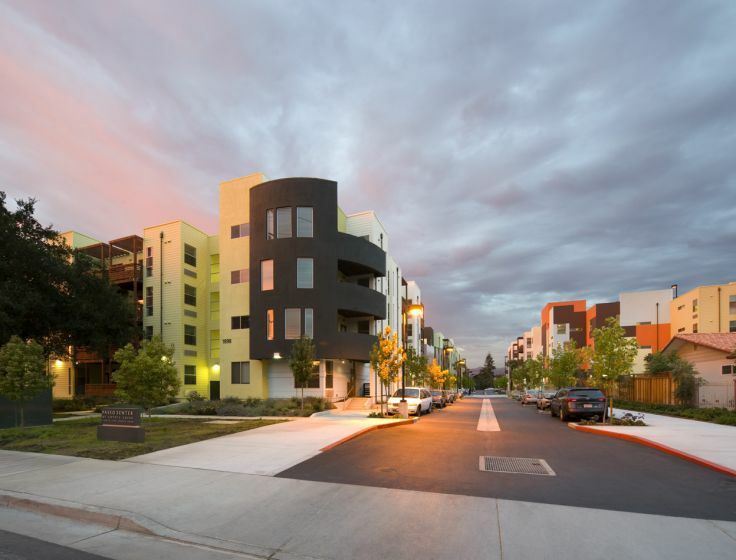 Paseo Senter, a 218-unit affordable housing development with supportive services located south of downtown San Jose, California in the Tully-Senter neighborhood, is a much-needed addition to the city’s supply of affordable housing. Designed to create a sense of place in a disconnected part of the city, Paseo Senter is a new urbanist-style project with a central pedestrian-oriented boulevard, or paseo, serving as the site’s physical and social organizing element. 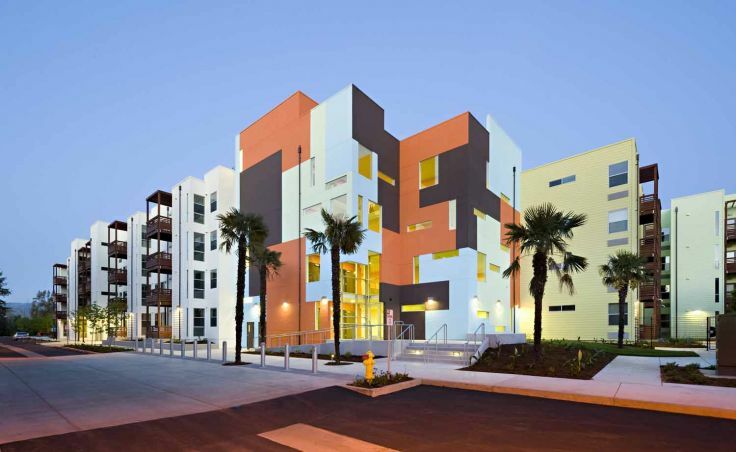 The buildings’ modern design, which includes bold colors and a diversity of materials, earned the project the 2010 American Institute of Architects (AIA)/HUD Award for Excellence in Affordable Housing Design. With limited undeveloped land in Tully-Senter, however, opportunities to meet these neighborhood goals were scarce. One of the largest undeveloped tracts in the neighborhood was located in the Coyote Creek floodplain, and despite its residential land-use designation in the city’s general plan, the 16-acre parcel lacked the necessary road frontage for development. The property was largely landlocked by four acres of city-owned property fronting on Senter Road that the general plan designated for parks and open space. Paseo Senter was made possible by a land swap between the city of San Jose and the owner of the floodplain parcel. Although the city-owned parcel was designated for parks and open space, many felt that its location along the busy Senter Road was less than ideal for recreation. 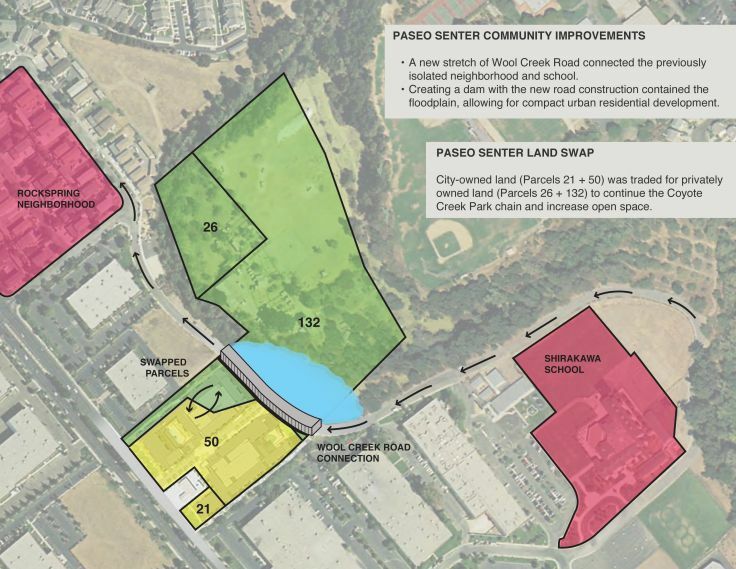 The city had long wanted to include the privately owned 16-acre parcel in its Coyote Creek Park Chain, and an agreement was made to transfer the two properties, with two acres going to the Santa Clara Water District for flood control.3 After the transfer, Charities Housing, a nonprofit housing developer affiliated with Catholic Charities of Santa Clara County, partnered with private developer Core Companies of San Jose to purchase the Senter Road property. 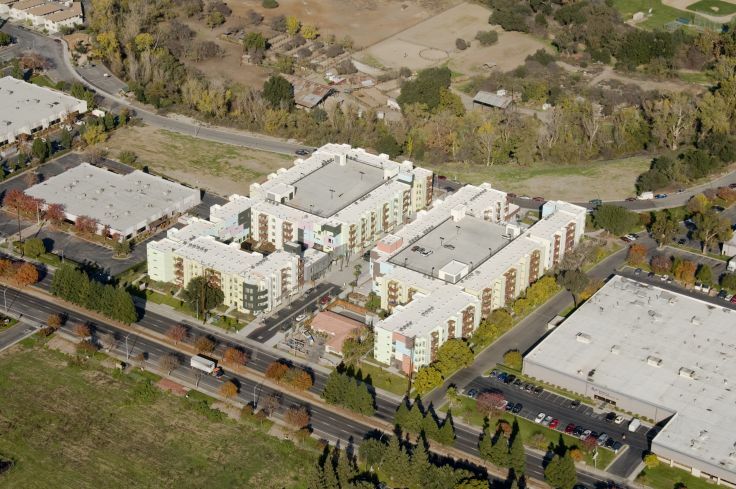 The development team worked with the San Jose Planning Division to secure a general plan amendment and rezone the property to allow high-density residential development. One condition for the project’s approval was connecting the northern and southern ends of Wool Creek Drive, linking the Rockspring neighborhood on the north with schools and recreation amenities on the south. Located near the limit of the Coyote Creek floodplain, the new segment of the road is elevated to serve as a flood control measure for the development. 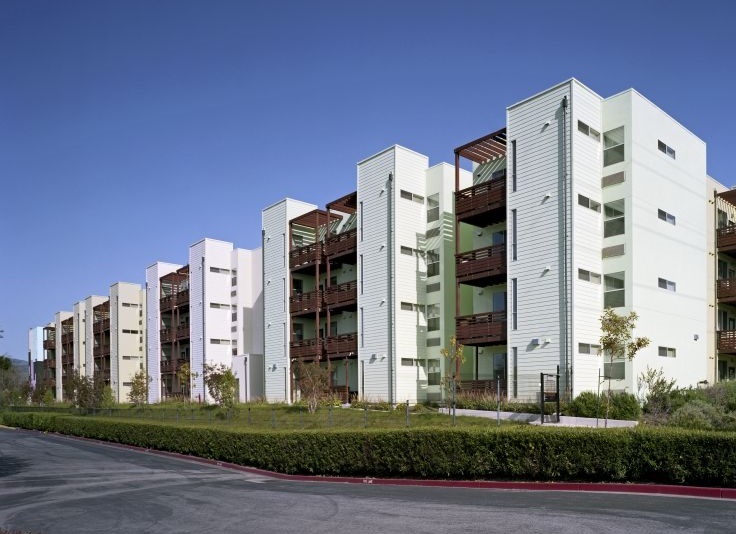 Paseo Senter’s award-winning design provides high-quality housing while also creating a public space that socially and physically connects the community. The project’s two buildings line the central paseo that runs from Senter Road to Wool Creek Drive. Occupying retail-style storefronts along the boulevard, supportive service providers attract pedestrians and add activity to the project’s defining public space.4 Estrella Family Services provides early childhood education to neighborhood children, and the Kinship Resource Center, operated by Catholic Charities of Santa Clara, provides a number of services and resources to grandparents and other relatives who care for children. The Native Doors Networking Senter also operates on the site, providing educational programs for Native American students in Santa Clara County from kindergarten through high school. 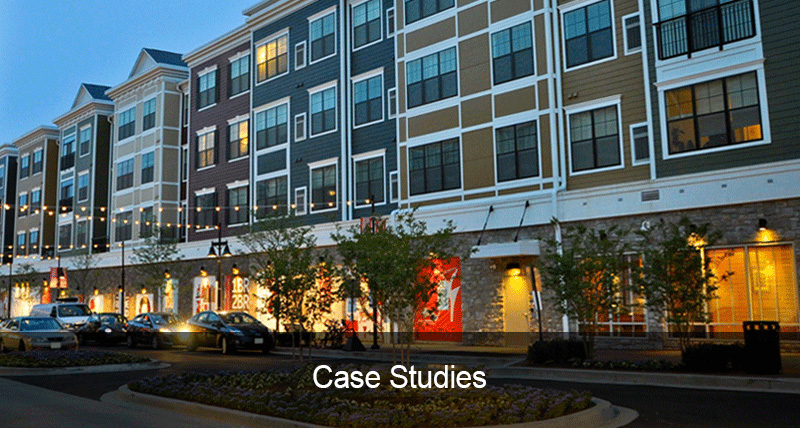 The project’s density required careful placement and massing of the two four-story buildings. The structures are set back from Senter Road to maintain consistency with existing development along the corridor and include bold façade treatments that reflect Paseo Senter’s diverse cultures.6 The contrasting colors and materials in distinctive facade geometries carefully control the visual impact of the two structures. Balconies for each apartment extend and retreat from the façades, providing additional visual interest. 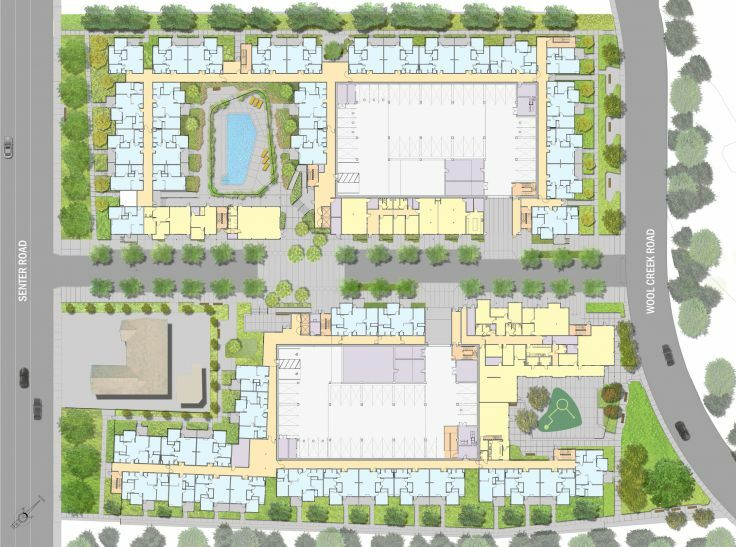 Perhaps the greatest design challenge was accommodating more than 400 parking spaces affordably and without compromising the vitality of the paseo.7 With the cost of underground parking prohibitively expensive, the design solution is two parking structures that are shielded by the residential buildings so that the housing serves as the project’s public face. 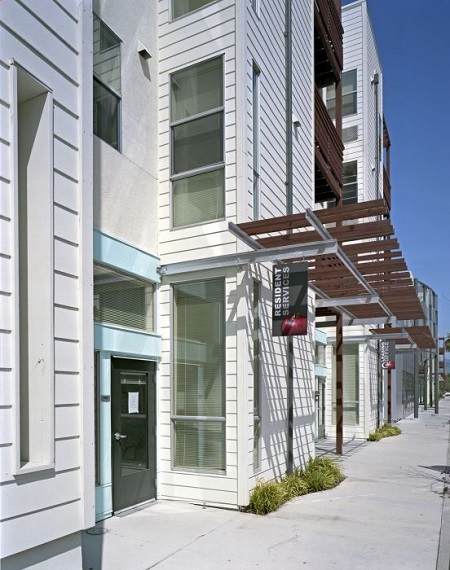 The development of Paseo Senter is the result of a close collaboration among private and nonprofit developers, local service organizations, and the city of San Jose. Made possible through a public-private land transfer, the project provides much-needed affordable housing to the city’s low-income population while improving neighborhood connectivity and expanding access to open space resources. The project’s modern design includes bold, geometric forms organized around a central paseo that is home to organizations serving the needs of residents and the larger community. City of San Jose Strong Neighborhoods Initiative, Neighborhood Advisory Committee Report. June 2002. “Strong Neighborhoods Initiative Neighborhood Improvement Plan: Tully Senter,” chapter 2, 10. City of San Jose Strong Neighborhoods Initiative, Neighborhood Advisory Committee Report. June 2002. “Strong Neighborhoods Initiative Neighborhood Improvement Plan: Tully Senter,” chapter 3, 1–4. Interview with Dan Wu, executive director, Charities Housing, 29 January 2013. Documents provided by Dan Wu, Charities Housing, 9 January 2013. City of San Jose Department of Planning, Building, and Code Enforcement. Development Review, Project No. PD04-084, https://www.sjpermits.org/permits. Accessed 25 January 2013. City of San Jose, zoning staff report, 6.